If you work for someone other than yourself, you're likely to receive an annual performance review from your boss. "When done well, reviews can greatly benefit both the employee and employer," says Darlene Price, president of Well Said, Inc., and author of "Well Said! Presentations and Conversations That Get Results." "Unfortunately, not everyone makes the most of these meetings. "Michael Kerr, an international business speaker and author of "You Can't Be Serious! Putting Humor to Work," says it's tempting and all too easy if you are on the receiving end of a review to express frustration at the process or get defensive. But you should resist the temptation, he says, "because you'll want to demonstrate that you are truly listening to what's being said and taking it all in without rushing to judgement," and that you are open to receiving honest feedback, and willing to learn and grow. "If you truly do feel the feedback is unwarranted, then a more constructive approach would be to saying something along the lines of, 'Thank-you for that. I'm not sure I completely agree with that assessment but let me take some time to mull it over and maybe we can sit down again next week once I've had a chance to consider it carefully,'" says Kerr. "Save those conversations for another time when you can have a constructive conversation about what needs to change to improve the process." "But that's not in my job description," or, "But that's not my responsibility." "Expressing these sentiments raises the ire of any supervisor because it makes you look like you are more concerned about shirking responsibility than you are about doing what needs to be done to help the team or organization succeed," says Kerr. "Managers want people who will do whatever needs doing regardless of whose responsibility it is." Again, this makes you sound not only defensive, but as though you are shirking responsibility and merely interested in doing the bare minimum required to get by, Kerr says. "I deserve a raise," or, "Can I have a raise?" or, "I should be making more money." Every employee feels this way. "The trick is to use your performance review to prove you've earned an increase in pay," Price says. "Rather than state the obvious, which may sound demanding and petulant, be prepared to recite three to five documented achievements where you've saved or made the company money. Or say, 'I'm really enjoying my job and growth opportunities within the company. What's the expected timeline in terms of earning promotions or raises, and what do I need to do to get there?'" "I wish you had told me sooner." That may very well be, but now is not the time to have that conversation, says Kerr. "Better to turn into a future-focused action by saying something like, 'I'm glad I know this now, and I'll definitely work on that in the future,'" he suggests. "I'm going to find another job unless..."
Giving your boss an ultimatum goes nowhere fast. "Plus, it sounds a little like Johnny Paycheck's 1977 hit, 'Take this job and shove it, I ain't workin' here no more,'" says Price. "Instead, speak to your boss about specific challenges you're facing, in a professional matter-of-fact manner." Include the quantifiable benefits that could be realized if certain resources were provided to you or obstacles removed. "That's what everyone says," or, "That's what my last boss told me, too." Saying something along these lines suggests that you have ignored an issue for some time or you are incapable of changing, Kerr explains. "If you've heard this feedback before, then consider that it's at the very least a common perception about you and work to correct the behavior." "If you think I'm bad you should see..."
A performance review is rarely, if ever, the time to talk about other colleagues, especially in a critical way. Kerr says this makes you look petty and as though you are passing the blame around or making excuses. "I'm bored with my job." "This statement says you're tired, jaded, or fed up with your current role and responsibilities," Price explains. "You're admitting, 'I don't want this job anymore - hire someone else.' Is that what you really want? " In reality, regardless of your feelings, your job is still important to the company or it wouldn't exist. "Instead, say, 'I believe I have even more to offer. With your approval, I recommend expanding my responsibilities to include...' This way, you sound goal oriented and proactive, rather than passive and uninterested." "Can I give you some constructive criticism now?" "No!" says Kerr. "Unless that's part of the review process in your organization, flipping comments around onto your boss will only get their back up and make you look overly defensive and unwilling to accept feedback." It's fine to express some thoughts and concerns - and if your boss invites you to give feedback, you should - but be careful not to offend anyone in doing so. "You're wrong," or, "Are you kidding me?" Don't argue. You and your employer may disagree and that's natural. Instead of becoming self-protective or defensive, just listen. "Be professional, courteous, and calm," Price suggests. "Rather than firing back with both barrels after an unmerited accusation, say, 'Help me understand your basis for that statement,' or, 'Do you have some specific examples?' or, 'Those comments do not reflect my memory and experience of the situation - may I describe my perspective?'" "Who told you that?" or, "Where did you hear that?" This also makes you sound petty and defensive - and worse, may give the impression that you will seek retribution after the review, Kerr says. "Better to ask, 'Can you give me a specific example of when I demonstrated that behavior so I know what to work on in the future?'" "I think you're being overly critical." "That may very well be, but saying this makes you look like you don't want to accept responsibility or you aren't concerned about the smaller details," Kerr explains. Remember, it's important to choose your battles. If you feel you are being unfairly targeted then focus on the issues that are most important. "That's not my fault," or, "It's so-in-so's fault." Good leaders take responsibility, says Price. "They empathize appropriately with the frustration or disappointment someone is expressing. Plus, they don't blame people or circumstances for the misfortune." While no one likes to feel blame, it's often necessary to hear it - even temporarily absorb it - while you empathize and decide how to tactfully respond. Something like: "I agree. Ideally, we needed to complete that project on time and under budget. Next time, here's what I'll do differently to ensure a better outcome..." is a better approach. Not using profanity may seem like a no-brainer, yet it's easy to let your emotions run away with you when you get defensive. "Avoid profanity as it will only make you look aggressive and overly defensive," Kerr advises. "But that's just who I am; you knew that when you hired me." What your supervisor will hear is: "It's your own fault, and I'm incapable of change and not interested in learning or growing." "Yup, you nailed it. That's me: employee of the year!" "Now is not the time to use sarcasm, even if you think it will diffuse the tension," says Kerr. "Using sarcasm will, once again, make you come across as disinterested. Similarly, it's all right to use a little self-deprecating humor to show that you can laugh at yourself, but be careful about taking it too far, as it can make you look insecure and lacking in confidence, and there's always the chance your boss will take you seriously." "You should have...," or, "You could have...," or, "You ought to..."
There's no quicker way to upset a boss than to suggest he or she has fallen short as a manager and is guilty of something (even if they are), Price says. "Instead, take a collaborative approach." Try something like: "To perform at my best, I really need clearly stated expectations. In the future, may we agree to...?" Or, "Moving forward, would it be possible to...?" "It's about time someone recognized the great work I'm doing." When receiving a glowing appraisal or positive feedback, avoid saying anything that will make you sound arrogant, Kerr says. For instance: "Tell me something I don't know," is something you should never say. "Simply accept the compliment graciously and move on." "I don't care," or, "Whatever," or, "That doesn't bother me." Blurting out one of these replies after your boss says: "Your 360 assessment this year shows a five point decline in effective listening skills," or, "Your peer reviews consistently indicate a lack of teamwork," is a terrible idea. "Don't let the death knell of indifference ring during your performance review," says Price. "It'll tank your career fast." Instead, say: "Wow. I was unaware my coworkers felt that way, but I'm glad to know now. Do you have any specific examples you can share that would help me better understand the issue? What steps would you suggest I take to improve in this area?" Saying nothing is almost as bad as saying any of the above. "One of the worst things you can do is demonstrate indifference through your body language, facial expressions, or by simply sitting in silence," Kerr says. "Expressing disinterest will make you come across as disengaged from your job, unconcerned about the goals of the organization, and unreceptive to accepting feedback." At worst, it can come across as passive aggressive. Price also believes this is a detrimental error. "An effective two-way performance review is packed with benefits: it can facilitate clear communication between you and your boss; clarify expectations; foster trust; establish goals and a career path; identify training needs; improve performance; reveal that you're a valuable high-potential employee; and even prepare you for a promotion." None of that happens if you remain silent, she explains. "So, always prepare several talking points, questions, and appropriate requests or recommendations. 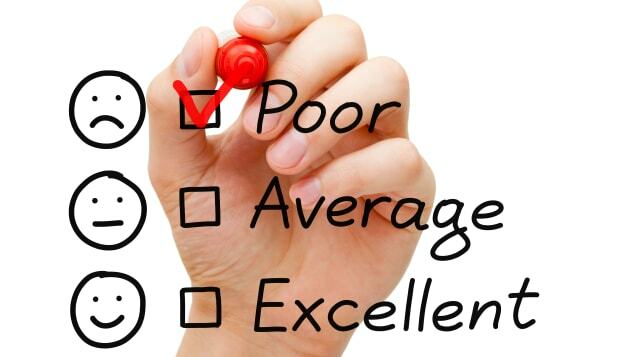 Show your boss that your performance review is a significant event, worthy of your full attention and participation."